Congrats to Fran and her coworkers at Bird-B-Gone in Irvine for being today’s office of the day! Antonio sang a special for the office while treating them to coffee and bagels for a morning break! Make sure you sign your office up to be the K-EARTH 101 Morning Show’s office of the day! To see other Office of the Day winning offices, click here. Those pesky pigeons around town will again be the target of eradication, following action by the city council Tuesday. Pigeons will be targeted by a U.S. Department of Agriculture specialist in upcoming months, at the same time as the city moves to update traffic signals, make improvements downtown and pave U.S. Highway 83 through town. The council unanimously approved the one-year street plans, 8-0. Written By: Ornithologist Rob Fergus Ph.D.
Summary: Ultrasonic bird control devices can be found in garden centers, home improvement stores and online through bird control product retailers. However, birds cannot hear ultrasonic sounds. This article written by ornithologist Rob Fergus, PhD. seeks to inform consumers about false claims of ultrasonic devices in relation to bird control. Sometimes hardware or lawn & garden companies advertise ultrasonic bird control devices that are supposed to drive birds away with high frequency noises undetectable to humans. Sounds like a good idea, right? Blast out sounds birds can hear but we can’t—what’s not to like? Check “Preventing Bird Invasions” on Page 52! THE suspension bridge over the River Trent is to close for three days while pigeon droppings are removed. The pedestrian bridge, which connects Victoria Embankment and West Bridgford, will close from April 3-5 while the work is done by Severn Trent Water. It was closed for almost two years and officially reopened in February 2010 after a £1.9 million repair and refurbishment programme to make it safe for public use. Severn Trent reservoir supervisor Franco Scola said the work was being carried out after complaints by members of the public about pigeon droppings on the bridge. Why installing physical bird deterrents is a better bet for effective bird control. That’s what some are saying about the problematic pigeon population at the Washington County Courthouse in downtown Jonesborough. In an effort to prevent the birds from roosting at the historic building, Jonesborough’s Historic Zoning Commission voted to remove the louvers from the backside of the building so there would be less places for the birds to gather and bird spikes were also placed on several ledges of the courthouse. Last month, county officials also decided to allow the USDA Wildlife Services Division to administer a toxicant to the birds that will kill them in one to three days. 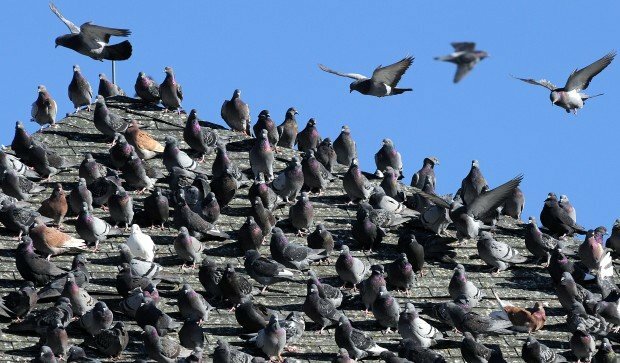 Laura Simon, field director of urban wildlife for the Humane Society of the United States, says these steps will not rid the building of its pigeon plight.